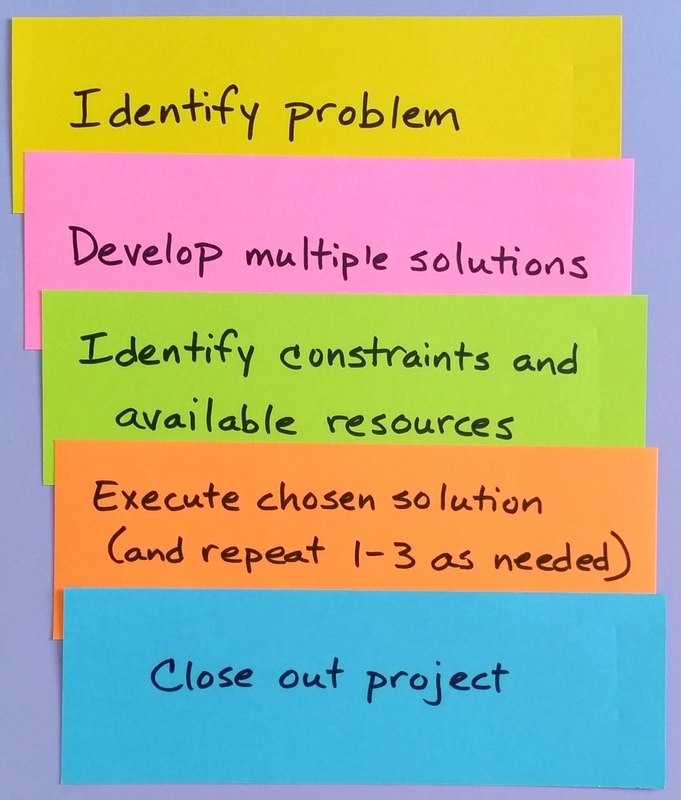 My recent post on project process summarized the steps in project development and implementation. As fancy as project flow charts can get, it really comes down to this, a simple set of procedures that can help you make a quilt, build a highway, or write a blog post. I’ll outline how these steps apply to making the Wind River Beauty quilt, one of my current projects. 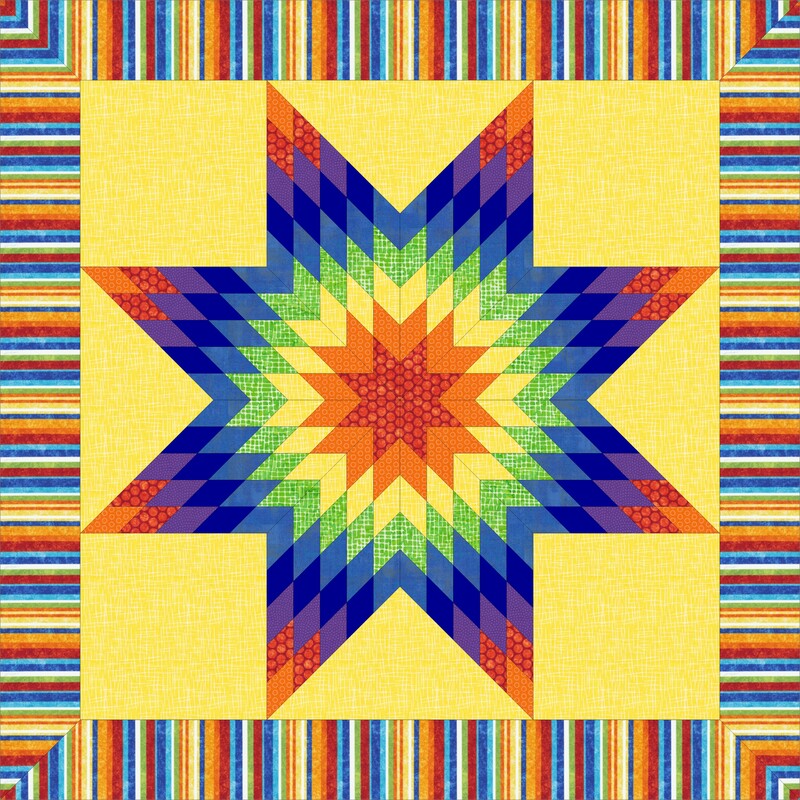 The problem to solve or objective to meet was to create a quilt using the New York Beauty block I made in a workshop last year. The original block I made, before modifying, is below. Making the block wasn’t difficult, but I wasn’t interested in making more. That meant any quilt using it would use only the one. 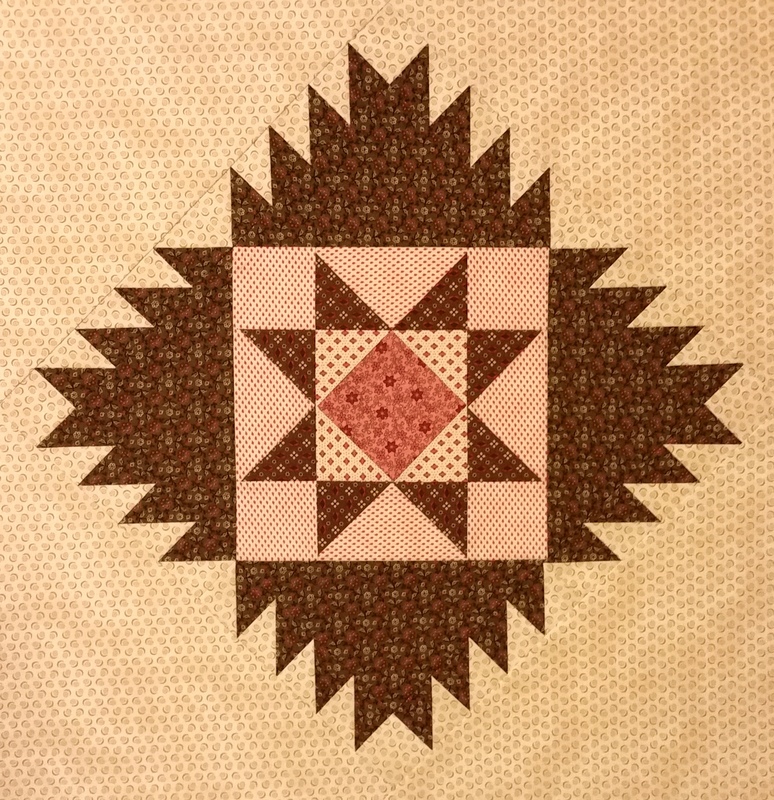 It could be a small quilt like a table topper; a larger ungridded quilt, such as one using the block as one of many blocks of various sizes and designs; a larger gridded one, such as one using a number of other blocks the same size, but different designs; or my specialty, a medallion quilt, featuring the New York Beauty as a center block. Honestly, I didn’t really brainstorm. I seriously only considered making a medallion quilt, as that was my intention as I made the block. There are still infinite options open within the category “medallion quilt,” so that decision alone didn’t determine my solution, but it did give it a framework. 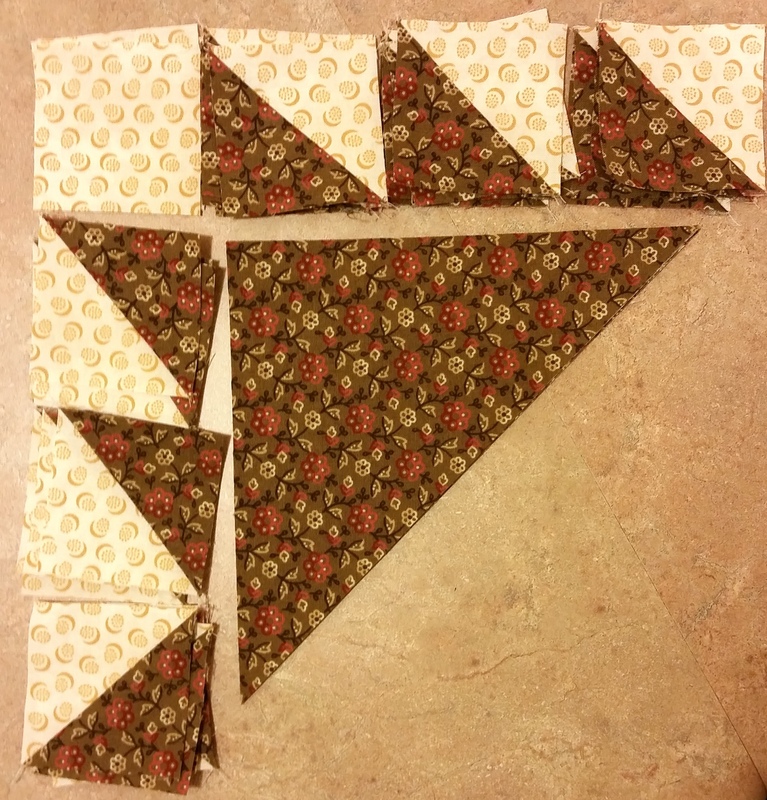 Prior to taking the workshop, I assumed that the block, if successful, would be used to center a quilt. The feature fabric mentioned above was both a resource and a primary constraint, since I had a limited amount of it. Besides materials, time and skills are both resources and constraints, too. There is no deadline for this project. In that sense, time is a relatively unlimited resource. My skills are a resource in the sense that I’m capable of the design and piecing for the quilt (although there were piecing problems, discussed in the next post.) However, my quilting skills are “intermediate” level. Over time I’ve chosen to do custom quilting more often for my quilts. As I do, I learn more and upgrade my abilities. But I still can’t do all the things I want to do for each project. This post is long enough! I’ll share more about the execution of my plan in another post. Thanks as always for taking a look. 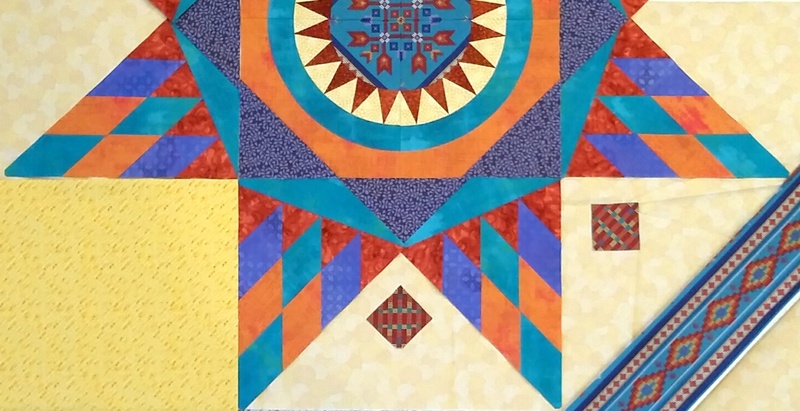 This entry was posted in Creativity, Medallion Quilts, Quilting and tagged Creative Process, New York Beauty block, Original design, Process, Solving problems, Wind River Beauty, Wind River reservation, Work in process on February 23, 2019 by Melanie McNeil. One of the books I bought early in my quilting life, which I still own, is Gwen Marston’s Liberated Quiltmaking (1996.) I tried the “improv” style of wonky stars and house blocks and found it wasn’t for me. 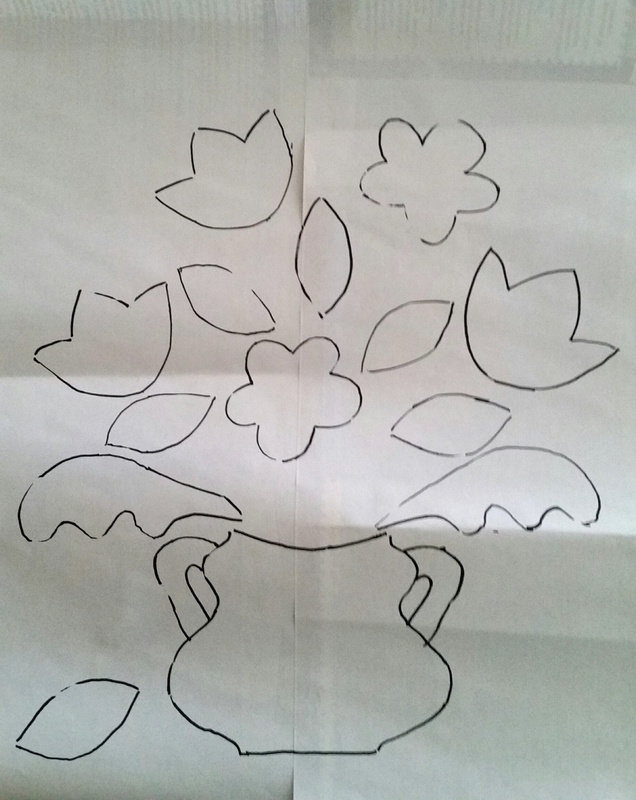 However, her improv process helped develop my own design methods. I’ve opened my thinking to agree that we can call “improv” a style, too. But you can create the style from patterns, or you can work the process and still end up with something most people would call very traditional. 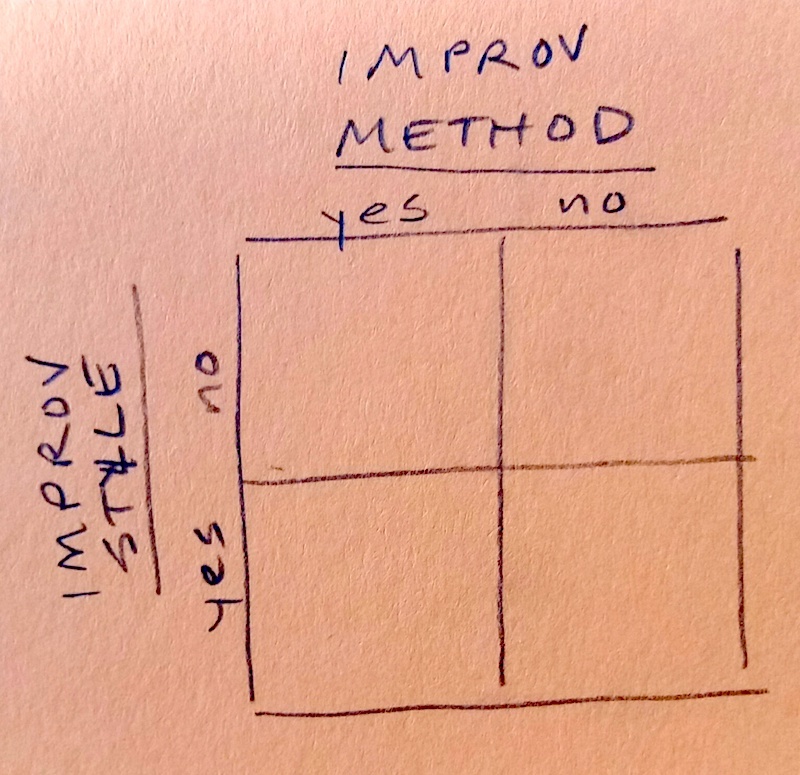 Improv style and improv process are two different things. They both have their place but they are not the same. What quadrant is most of your quilting in? Most of mine is upper left, in improv method but not improv style. What Does This Have to Do with Gwen Marston? Gwen Marston is often thought of as the founder of improvisational style. (I would argue she is not.) Marston has worked with both traditional and liberated styling for decades. I have five of her many books and two focus on historical styling from the 1800s. If you understand that this is the underpinnings of her work, you can see it in what has developed since then. 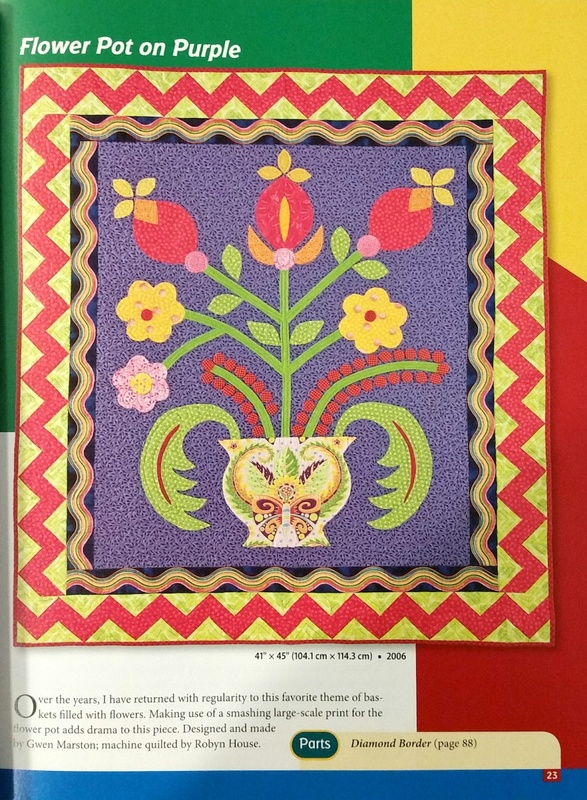 In the book Freddy & Gwen Collaborate Again (with Freddy Moran, 2009,) Marston includes a quilt that reflects both her traditional roots and her improv styling. Freddy & Gwen Collaborate Again. Gwen Marston and Freddy Moran, 2009, p. 23. Three years is a long time for development of one of my quilts. The drawing gave me a starting point, as did the purple background. I chose fabrics for flowers and leaves, most of which were too wimpy against the strong purple and didn’t end up on the quilt. My intention was to needle-turn appliqué the piece. After a couple of leaves, I knew that wouldn’t happen. And so the project got relegated to a bin of works-in-process, or more accurately, works-in-waiting. Last year as I experimented more with appliqué, I brought it out, chose new fabrics for the center, and began again. Skipping to the punchline, here is the finished quilt. Inspired by Gwen. 45″ x 55″. Photo by Jim Ruebush. January 2019. 1. After auditioning a variety of colors for the leaves, flowers, and urn, I chose strongly saturated ones that held up to the purple and determined the rest of the color scheme. 2. I adjusted the size of the center with red strips at the top and bottom. This allowed the hourglass blocks on the inner border standard sizing. 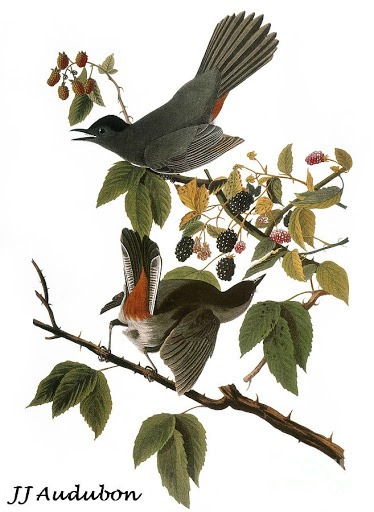 The hourglasses are scrappy of reds, pinks, oranges and golds, greens, and purples. 3. Visually there is A LOT going on in the hourglasses, which led to the calmer choices in the next border. 🙂 I wanted to extend the purple from the center but had very little of it left. I auditioned several purples and wasn’t happy with any of them. They didn’t “go” with the center. The best way to fix that is to use more than one. The more you add, the more they all go together. So the side borders with appliquéd vines got one purple, while the upper and lower borders with semi-circles on chartreuse green got a different one. While there are lots of greens in the leaves on the sides, and the vines are hand-cut squiggles, the upper and lower borders are fairly regimented, retaining some order. 4. The outer border again reflects the influence of Marston’s quilt, though I didn’t realize it until the top was almost done. Yes, I actually had the red zigzag pieced when I looked at the inspiration photo again and saw that I mimicked it without intending to. The other colors in the outer border repeat those in the hourglass border, and they are the same shape and similar size. The repetition helps hold off the chaos that could have erupted here. 5. I “custom” quilted it using different motifs and threads by section. There is red thread on the red triangles of the outer border, to strengthen them rather than diminish the color. Purple thread is on the purple background of the center for same reason. Most of the rest has a neutral, very fine thread to provide texture but allow the color blast of the surface to dominate. 6. I finished with a green binding. The technique here is as improvisational as the design method. I used several different methods of appliqué in this project, choosing whatever seemed to work most simply. A few shapes are applied by hand; some are fused and finished with a zigzag; some are stuck down with glue stick; the semi-circles use a completely different method. 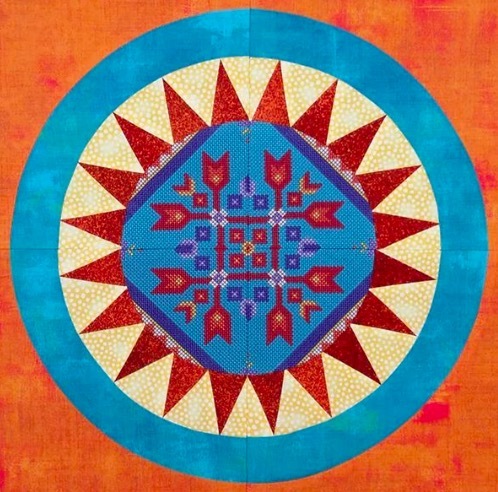 Gwen Marston has been an inspiration in my quilting life since nearly the beginning. I’m pleased to finish this quilt that shows that influence more directly. 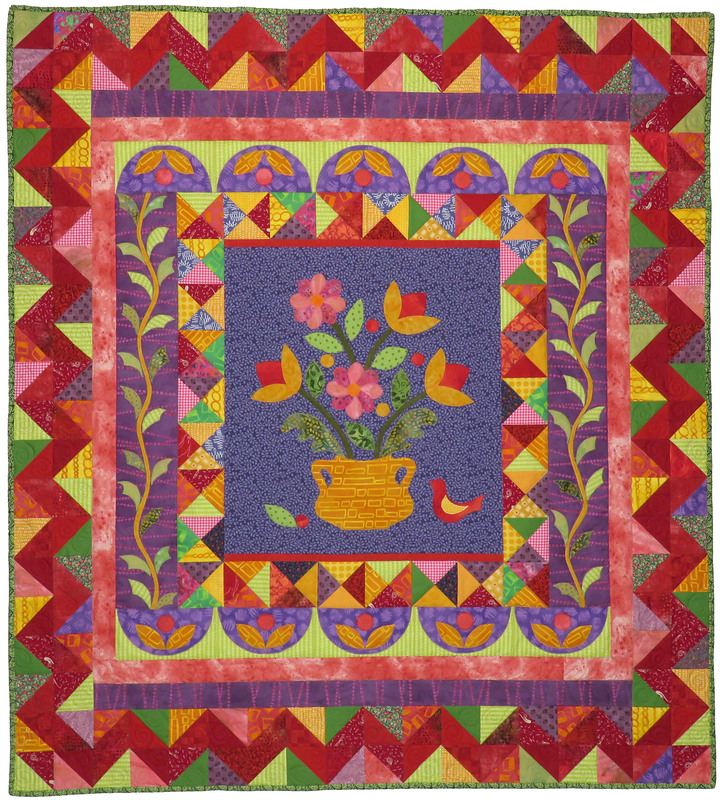 This entry was posted in Creativity, Medallion Quilts, Quilting and tagged Creative Process, Gwen Marston, Improv, Improv method, Improv style quilts, Improvisation, Improvising, Process on January 19, 2019 by Melanie McNeil. The pretty heart in the middle was printed like that from fabric I bought eleven years ago. I drew the hands and crown from the basic Claddagh ring symbol. And then I encircled it with a ring of batik. It is all on a black Kona cotton background. At the time I wasn’t sure what I’d do with it, or if I would do anything more. I considered the possibility of creating a small wedding gift for Son and his fiancée. But I didn’t have a plan. Then about a month before the wedding, I started hankering to make that gift. I thought it would be meaningful to represent the closest family members in a personal way. Including Jim and me, our daughters’ families, and the bride’s parents and sibs’ families, there are 20 of us. Because there were already hands in it, I wanted to use a handprint from each. That required swift help from the bride’s family, as well as from our daughter who lives far away. 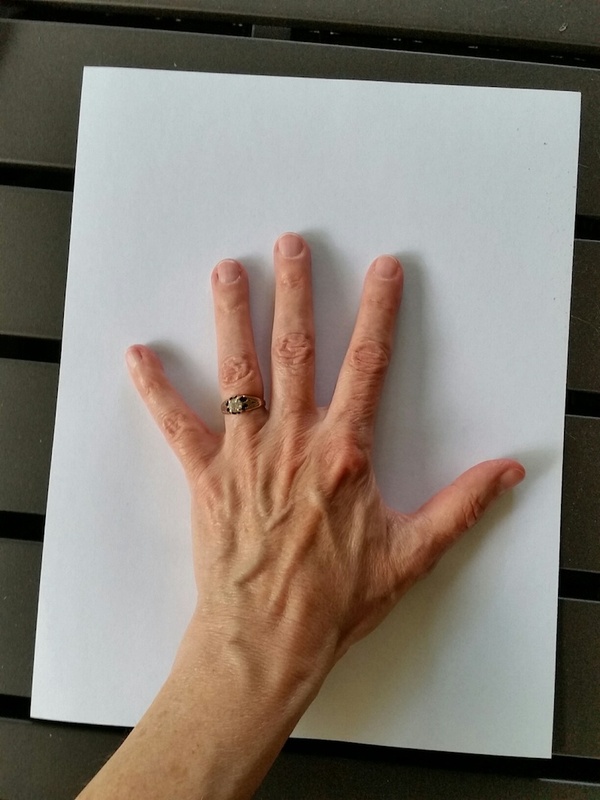 I asked for a photo of each family member’s hand, on a piece of white copy paper with all the edges showing. That would allow me to standardize the sizes to scale them as needed. Either hand, left or right, would do just fine. Here is my hand. He and I agreed on a size as compared to the hands in the Claddagh ring, and as they would appear on my monitor, and we re-scaled them all to that. I flipped each image and then traced each hand as it appeared on my monitor (basically as a light box) onto a separate piece of fusible web. I’d already decided to use a different fabric for each of the family units (Jim and me, bride’s parents, older daughter and family, etc.) There were six different families, and six different fabrics used for the hands. Besides manipulating the hand images, there also was the matter of the Claddagh ring. First, the pretty pink heart in the center somehow picked up a minor stain. Second, it was appliquéd on a relatively small piece of fabric. I wasn’t sure how big the quilt would be, but knew I needed more than the 15″ or so that the ring was on. Also, I thought the green batik ring by itself was a little stark, and I wanted to add leaves around it to create a wreath. Ultimately, I redid the Claddagh ring completely on a new background, large enough to contain whatever else came next. I zigzagged the ring with leaves and the other components of the Claddagh symbol down to the background before dealing with the 20 hands. Then I began arranging the hands. Jim had already done a mock-up in Photoshop for me, so I had a pretty good plan to use. I put the parents’ and siblings’ hands in the first ring around the Claddagh, and then organized the sibs’ partners and children in the outer ring. Here are a few pictures of the process as it developed. One of the families has seven members, so distributing those hands in a balanced way led many of the other decisions. Also, the tiny hands were paired with larger ones. Even when all the hands were in place, there were gaps that looked awkward. I filled them with more hearts cut from the same fabric as the center heart. Finally, I drew Celtic knots to add to the corners. Click on any picture to open the gallery. I knew that I wouldn’t stitch all the hands down with the domestic machine, as I was afraid that manipulating the fabric so much would loosen the adhesive and make the whole piece look worn and tired. Instead, I did raw-edge appliqué around the hands and across the palms when I quilted. Besides the appliqué-quilting on the hands, I also did a small free-hand design within the black background, and once I got it off the frame, I went back to the domestic machine to zigzag the Celtic knots into submission. Rather than applying a basic double-fold binding, I faced it with black to give the edge a smoother finish. When it was all done, I used a black Pigma pen on the muslin backing to write the names on each of the hands, and complete the labeling with the name of the quilt, the bride and groom, and the wedding date. Again, click either photo to open the gallery and see larger. Hands and Hearts. 29″ x 29″. July 2018. Photo by Jim Ruebush. Hands and Hearts. The back. I love that the quilt comes from the contribution of all the family members, and that Jim worked so closely with me on its design. The style is unique, maybe even quirky, certainly bordering on folk art. It’s also very personal, just as intended. 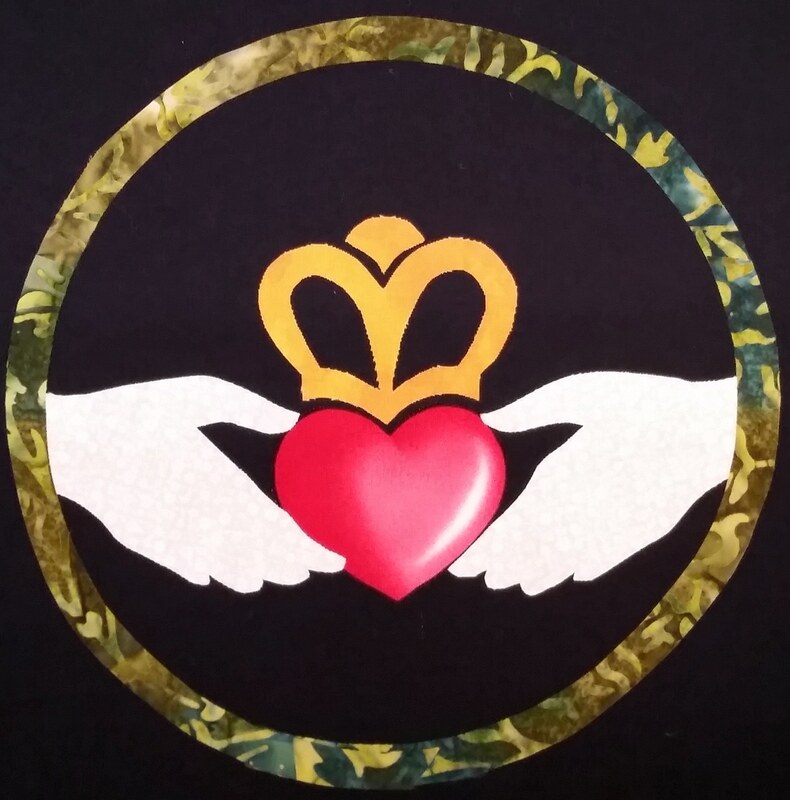 This entry was posted in Creativity, Quilting and tagged Applique, Claddagh ring, Creative Process, family, Folk art, Folk art quilt, love, Machine applique, Process, Raw-edge applique, Wedding quilts on August 3, 2018 by Melanie McNeil. 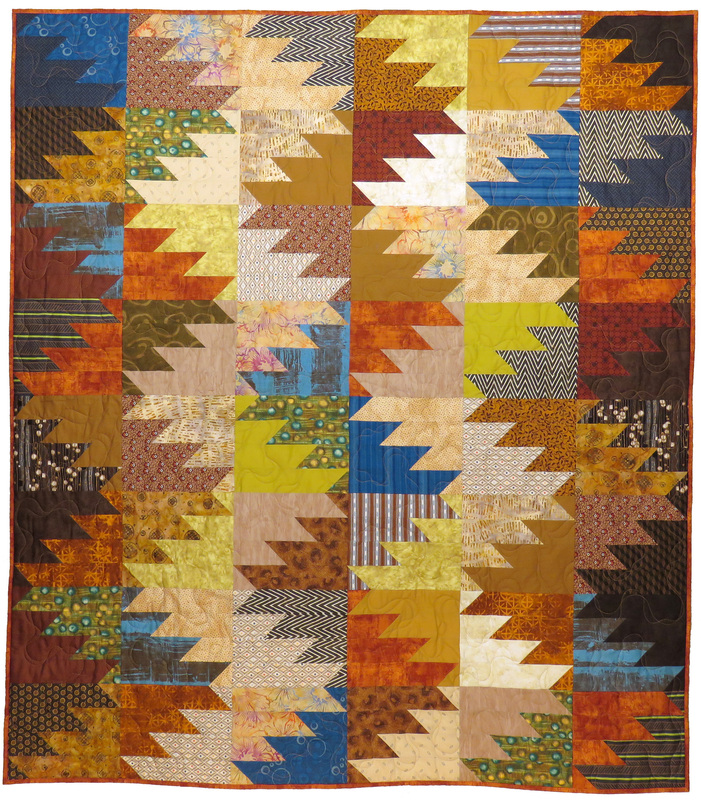 If you love medallion quilts and you love triangles, you just about have to love Delectable Mountains medallion quilts. 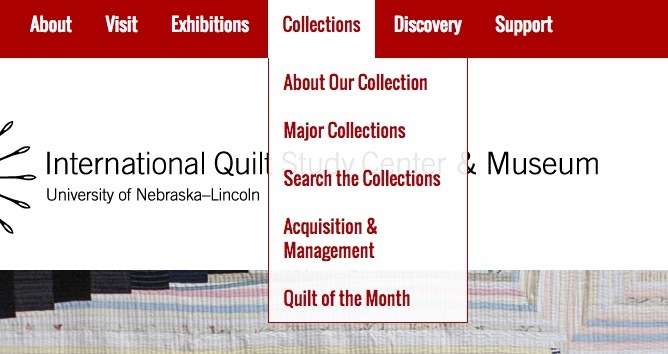 A couple of weeks ago I was paging through medallion quilts at the International Quilt Study Center & Museum. 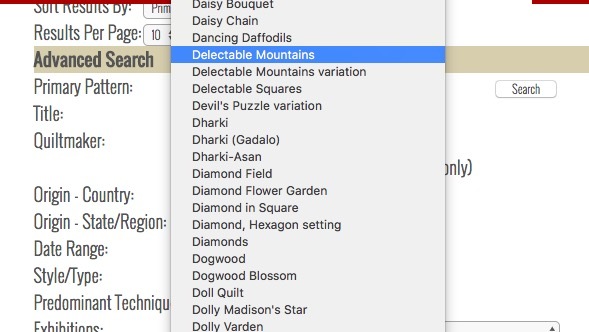 You can search the collections using a number of different variables, including keywords, primary pattern, quiltmaker, origin, and more. At the time I used the keyword “medallion” and found 181 examples. Within that set there are a number of glorious DM medallions. 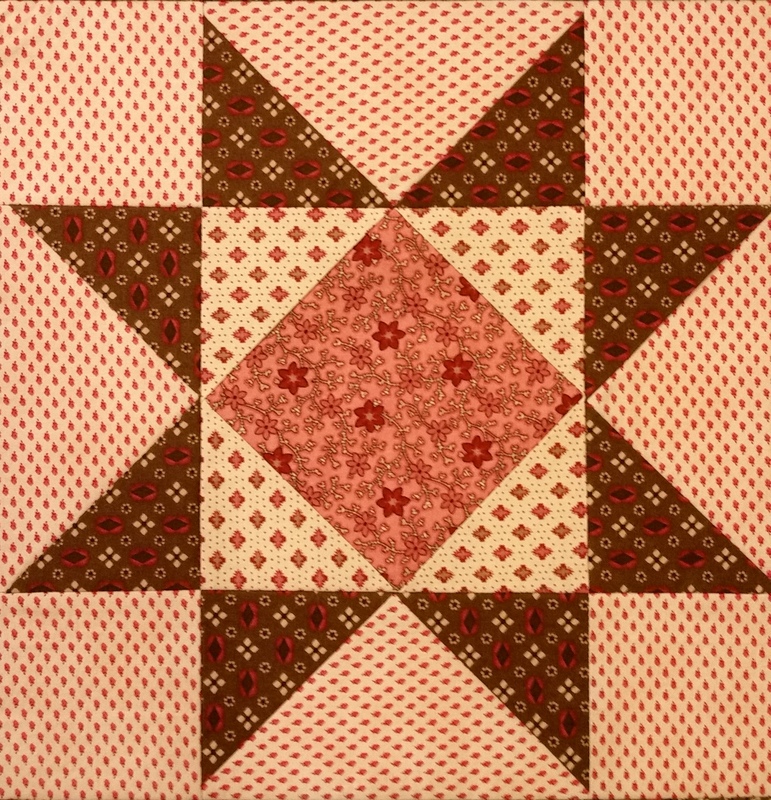 I was inspired by the simplicity and high contrast of the design, and decided to make it as a red and white quilt for my guild’s June show. 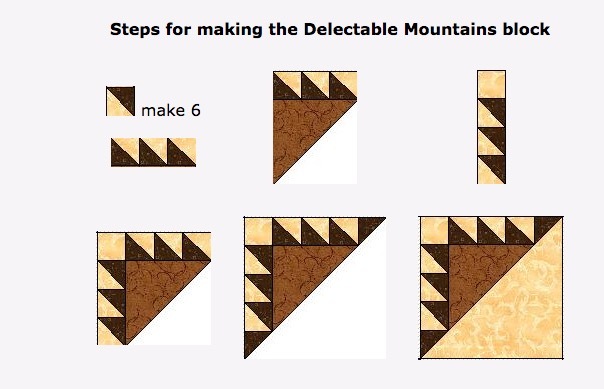 There are two basic ways to create a Delectable Mountains block. One is the way I made my DM quilt last year. It uses large half-square triangles that are sliced into segments. Once the segments are rearranged, they created a jagged block. Still Climbing Mountains. 57″ x 64″. August 2016. Made from stash. Photo by Jim Ruebush. I thought I would use this block style to create a medallion. I thought it would be “fast” and “easy,” as the block quilt above was. However, the block is not square (in mine it finishes at 8″ x 9.5″.) The non-square block creates some math issues for the outer borders, making it neither fast nor easy. I also checked a few of my books, to see if any had a good pattern I could pull from. One does, but it’s a badly written book with a badly written pattern. In the end I decided to do what I usually do: make it up as I go along. This project falls squarely in the set I’d call a challenge and an opportunity. Realizing that my first plan wasn’t workable as considered created a barrier. Choosing to go old-school with construction provides the opportunity. A center block using a few old favorites, and new brown fabric. The block is an odd size, finishing at about 11.5″. Now you can see some mountains. The next border will have more of them. So far this actually has been easy. The center block is a variable star. It is set on point with brown. Then the brown is bordered by a row of brown half-square triangles, creating the mountains. Finally, the whole center (everything made so far) was put on point again. See my post about putting blocks on point. Next comes a border of brown mountains with double pink background. This is the one with a little trouble on the math side. But I’m confident I’ll find a way to make it work. This entry was posted in Medallion Quilts, Quilting and tagged Challenge and opportunity, Creative Process, Delectable Mountains, Inspiration, Medallion quilts, On point, Process, Traditional quilts on January 29, 2017 by Melanie McNeil.